Pam and I recently bought our first house. Yay! As you can imagine, living in L.A. means housing is very expensive, and we didn't have very much left in our budget to renovate the new house as much as we would have liked to. One of the things we knew we wanted to concentrate on was creating as nice a kitchen as our dollars would let us. So that meant the usual suspects: IKEA cabinets, cheaper countertops (we wanted Ceaserstone), and less cabinetry. We also kept the stove that came with the home as we did not have the Benjamins to splurge on a new one. We also kept our old refrigerator. The only appliance we bought new was the dishwasher, also from IKEA. Although the kitchen itself is probably another blog post in and of itself, I don't want to focus on it for now. Instead, I'd like to show you how we took $500 and made ourselves a pretty cool island that we love. 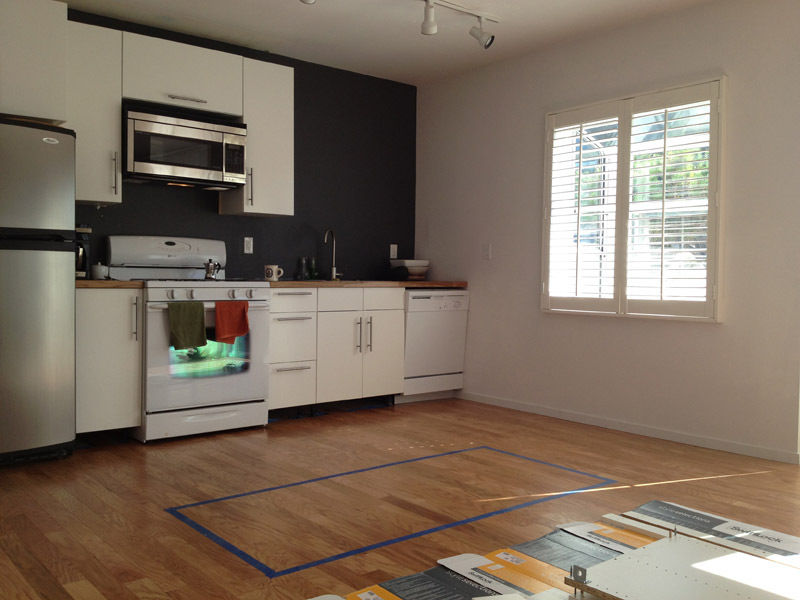 First, we outlined the footprint of the island, 3'x6' with Blue painters tape. FYI, the kitchen is not finished in these photos. Once the base was built, we attached the MALM dresser. To the left of the dresser (as seen in this view) is an IKEA base cabinet. We found it in AS IS at IKEA and it was in rough shape as you can see. We snatched it up for $10!! With both bases in, we can now move on the next step: the sides and top. For the sides and the top we decide to use IKEA wood countertops. We purchased two; each one is 3'x6' basically. We cut one right in half, and woila, the sides of the island! The top is, you guessed, a full sheet of the IKEA wood countertop. This is so heavy, we barely had to fasten it in place much, we just used two brackets on either end, tucked away inside so you can't see them. This is what the other side looks like. the MALM drawer gives it a very refined look we think. The only thing left to do is to add some shelving on the right and a toekick. 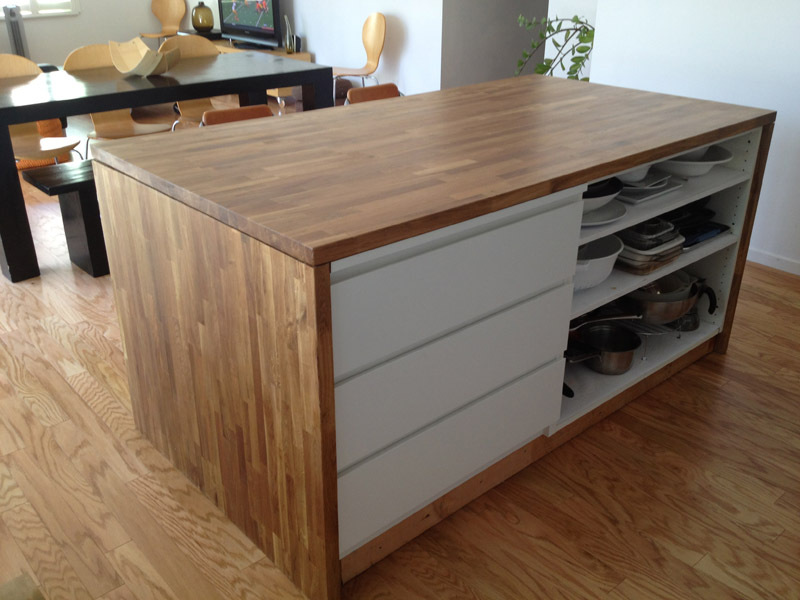 For the face of the island, we attached a piece of 1/2" plywood to the 2x4 base and the back of the cabinets. We then used a sheet of vinyl wall panel (called Plas-Tex) that we picked up at Lowe's. It is attached with liquid nail, that's it. So far, its held up well. Easy to clean kick marks too! Yes we would have liked to have some doors here instead of exposing the pots and pans, but the budget wouldn't allow it. Nobody sees this side as much anyway so we're ok with it. Well, there you have it, our $559 kitchen island. Hopefully, it will inspire you to do something you're happy with, and not spend too much money doing it. I did sand it and seal it when it was all put together of course. (2) Countertops, IKEA Numerar $390 + tax = $424. Newer PostGrass Be Gone. How to get rid of that water pit we call lawns.